Kefir Water, the healthy Soda!! 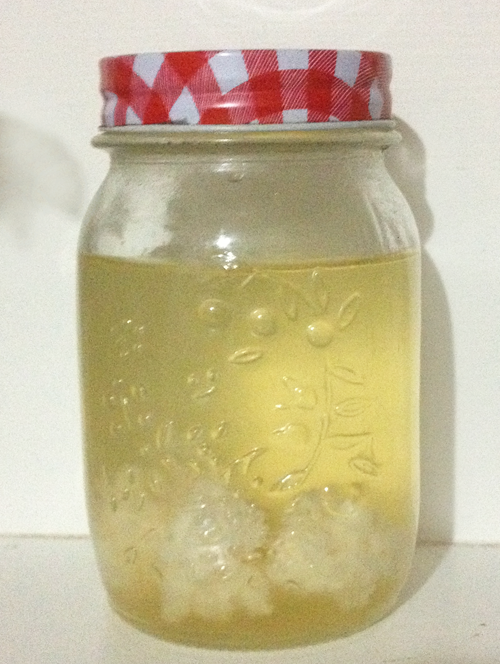 Kefir Water may not look like much, but it tastes good. It is seriously delicious. Our family is hooked, I can not make Kefir Water fast enough. My “little one” loves it so much, plain, flavoured, anyway it comes. Kefir Water is a fermented beverage teeming with beneficial bacteria, it’s easily flavoured, simple to make & a perfect replacement for commercial fizzy drink. It tastes like a slightly dry, mildly alcoholic & gently fizzy soda that has a faint fermented taste. Kefir Water not only tastes great but it is impressively rich in micronutrients, enzymes & benefical bacteria, it is a great DAIRY free source of probiotics. 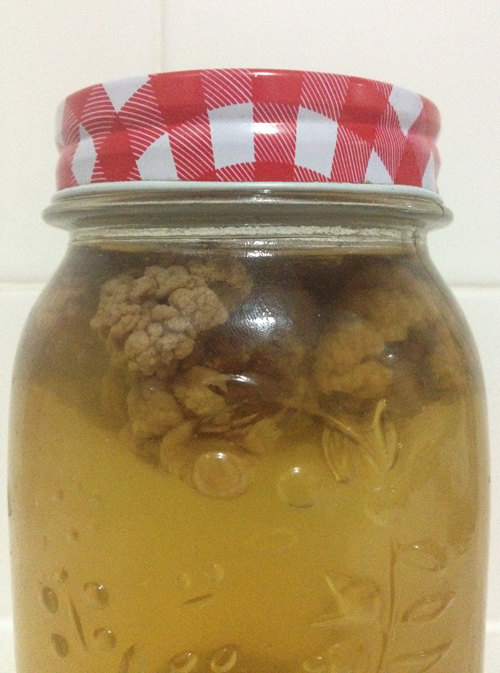 Kefir Water is made be fermenting a scoby (symbiotic culture of bacteria & yeasts) in sugar water. The beneficial bacteria & yeasts present in the grains metabolize the sugar & turn it into actic acid and thus making yummy Kefir Water. Stir your sugar into the lukewarm water. Pour it into your glass jar and add your grains. Screw on the lid & leave out on the counter for 24-72 hours depending how warm your home is. In cooler climates the Kefir will take longer to brew, when its warm you can have Kefir Water in 24 hours. Once your Kefir water has reached your required taste, strain out the grains & repeat the above process with a different sugar. Bottle your Kefir water & screw the lid on. If you want your kefir to be more bubbly leave it out on the counter for another 1-2 days. If your happy with it refridgerate & enjoy. 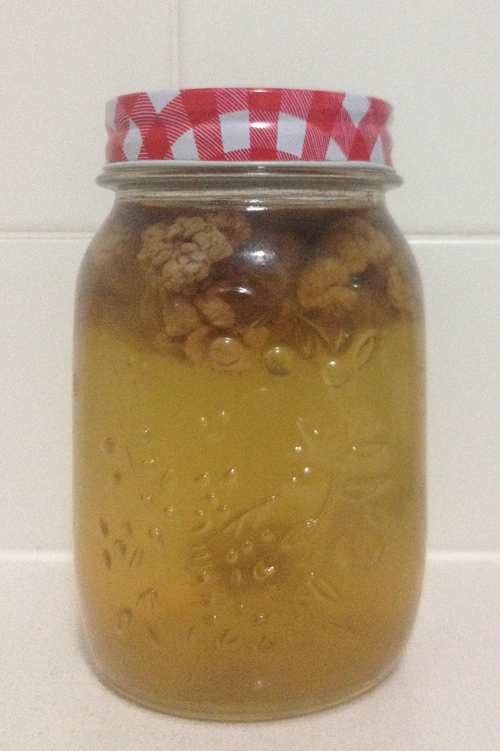 *Water Kefir grains like variety to keep growing, I feed mine with raw sugar, brown sugar, coconut sugar, rapadura sugar & palm sugar. Alternating the sugars on a regular basis so that my grains stay nice & happy. *Water quality is important but I have read that the grains do not like RO water, they need minerals to keep growing so I prefer to use boiled tap water even though we have RO water on tap. I boil the kettle with the lid off for several minutes to try & boil off some of the impurities. If you use filtered water it is recommended that you add egg shells to the water to re-mineralise the water, but I have never actually done this. *Never use Honey – the honey’s anti-microbial properties will attack your grains. The process to convert your grains takes about a week in total. Take your milk grains that you want to convert & wash them gently in purified water (I use R.O water – but you could use boiled or bottled water). Rinse your grains several times until there is absolutely no milk residue. Boil the kettle with the lid off for several minutes to try to boil off as many chemicals in your tap water as you can. Leave the water to cool, pour in 500ml of warm water into your jar & stir in 2 T of sugar. Let the sugar dissolve & add the grains, screw on the lid & leave to do its magic. Leave for 48 hours, giving the jar a shake every 12 hours or so. Once the 48 hours are up, pour out the contents & repeat. Repeat 3 – 4 times before trying to drink your Kefir. *I have converted about 1/4 c of milk grains & that makes 500ml of Kefir water within 24 to 48 hours. *You can add a variety of fruits & spices to your Kefir water to make all sorts of different lightly carbonated beverages. When bottling your Kefir add the juice of one lemon for instant lemonade.